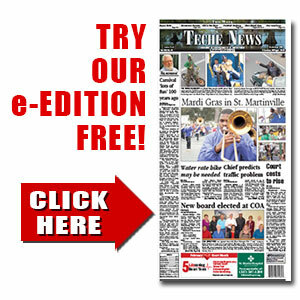 TecheToday.com | Teche News | St. Martinville, La. | News, Sports and Entertainment for St. Martin Parish, La. News, Sports and Entertainment for St. Martin Parish, La. Pete, Alvin, 53, 600 block of Cecile Blvd., Breaux Bridge; simple burglary, Breaux Bridge Police Department (BBPD). Trahan, Eddie, 36, 1000 block of Robert Ln., Breaux Bridge; parole violation, Louisiana State Police (LSP). In a special meeting Monday, the Town Council approved a budget with a total of $16,250 in salary increases for the mayor, clerk, chief of police and five council members. Members of the Acadian Memorial Foundation marked the 20th anniversary of the opening of the Acadian Memorial during their annual membership meeting held June 18. Boudreaux, Ted, 34, 1000 block of Ragan Rd., Breaux Bridge; failure to appear, warrant, St. Martin Sheriff’s Office (SMSO). Comeaux, Romona, 43, New Iberia; domestic abuse battery, St. Martinville Police Department (SMPD). Each year the week of June 26 is declared National Mosquito Control Awareness Week by the American Mosquito Control Association. BUSINESS OF THE MONTH DELEGATION (from left): Angela Cliburn Taylor, Arnaudville Area Chamber of Commerce; the Rev. Keenan Brown, pastor; Bea Zerangue, church volunteer; Huey “Joey” Wyble II, Arnaudville Area Chamber of Commerce; Sheila Gresko, director of Religious Education; and Betty Sanders, office manager St. John Francis Regis Catholic Church. Not shown: Betty Devillier, volunteer; Deacon Ken Arnaud; Ricky Thibodeaux, church custodian; and Girley Olivier, coordinator of St. Therese Thrift Shop. The Arnaudville Area Chamber of Commerce “Business of the Month” is St. John Francis Regis Catholic Church. A proposed salary raise for five Breaux Bridge officials, if approved by the council, will be the first increase in pay for those positions in several years. The cause of promoting accessibility to public facilities brought several seniors, special-needs residents and parents of special-needs children to the June 14 meeting of the Breaux Bridge City Council. The St. Martin School Board continued a string of very successful bond sales last week with the awarding of bids on the sale of the first installment of the $64,500,000 in general obligation bonds approved by parish voters earlier this year. Bonin, Braidon, 31, New Iberia; failure to appear, warrant, St. Martin Sheriff’s Office (SMSO). Perry, Steven, 57, 400 block of Nettie St., Breaux Bridge; simple criminal damage to property to $500 (SMSO). At the Parish Council meeting on Tuesday, June 7, Brandan Trahan of Court Appointed Special Advocates (CASA) made an appeal for support from the parish. Henderson resident Sally Angelle appeared at the Monday, June 13, Town Council meeting seeking a solution to a long-standing problem. The Louisiana Legislature is considering laws to define "speed traps." Should the town of Henderson be considered a speed trap? The 2016 high school football season has reached the halfway mark and the District 5-4A campaign begins Friday for the league’s five teams.